My artistic journey has been filled with logic and structure - that’s how my brain tends to work. I started creating art in July 2017 after a relapse from MS (multiple sclerosis). Since that time, my journey has taken a few different turns as can be seen through the evolution of my signature. I started with simple initials in 2017 and my initials and year were a part of each creation. I did what I saw being done in other artist’s work and followed suit. A simple flourish and passing thought became a signature element in my work in early 2018 in the form of a red dot. The “cool cat” pictures of the kitty with sunglasses were some of the first pieces I ever created after developing artistic ability in mid-2017. The picture within THIS picture on the wall is actually my first ever foray at creating something abstract and moving with rhythm and feeling. A real experimental phase for me. It was ALL an experiment here. I was totally out of my realm - brand new ability. 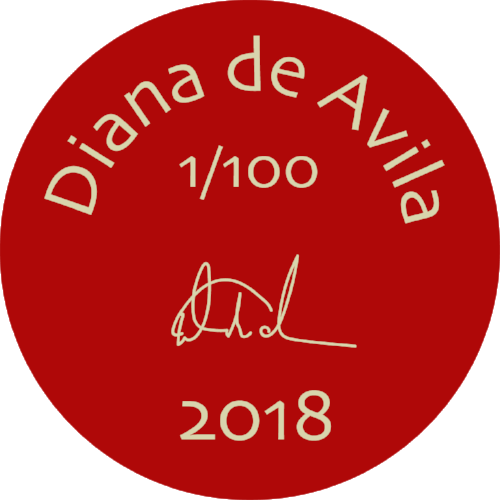 As I continued to create - at some times more prolifically than others - I wanted to define my signature a little more clearly. 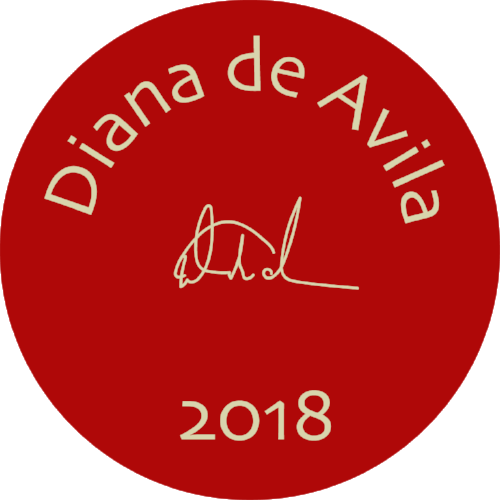 So I added a stylized script signature with my name “Diana de Avila”. I began to add something new at this point. A simple “red dot” embedded into each piece of art. Each work would carry (when I could remember to add it) a signature red dot. There was no uniformity or size or shade. The dot would make it’s way onto most of my pieces starting in March 2018. The signature would also carry a red dotted “i” in my last name. I loved adding the “red dot” and creating a scavenger hunt for the onlooker. Some are more prominent than others. “Fountain of Youth” a Fractal manipulation with a sci-fi galactic feel to it. The stylized signature has been fun and carried my work through two art shows. I decided it was time to create something more individually mine. As complex and intricate as some of my work can be, I wanted something very simple for my signature. I wanted to create something easily recognizable … even from a distance. The “red dot penny” or simply “penny” uses a simple font and layout. I have a special reason for choosing the simple design and highlighting shape. It will identify my work from a distance and become recognizable over time. The Red Dot “Penny” for a non-closed edition will be placed on the bottom right of a piece. When denoting a limited edition run, I will move the dot to the left and add the series number. I’ll also place the “red dot” somewhere else in the piece. It will become the differentiator. The “penny” on the left contains a series number and signifies a closed edition. That’s the intention but not always followed. The new red dot “penny” will be easily recognizable. For those who follow my work, the placement will become recognizable too. I find a lot of my identity within that “penny”. A favorite color and a perfect and simple shape. "Serenity" - simplicity and peace. Water lapping at sun kissed ankles. It is the second most recently piece to get the new “penny” signature added. Added Sarasota, FL to my “penny” - seems like the finishing touches. I’ve also begun adding my “penny” without the characteristic red background on some pieces. I don’t want it to detract from the artwork.